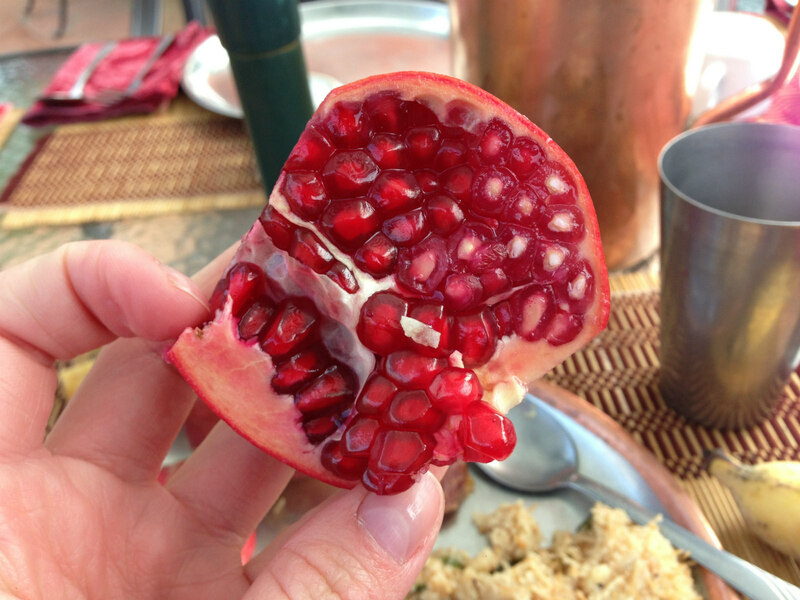 When I went to India I became obsessed with pomegranates. They were slightly different from the ones in the US; small, sweet, and juicy. Every morning I had to work for it. Picking out the fruit seeds in a pomegranate is time consuming and can get messy. I was introduced to a method of cutting them in half and pulling at the sides of the flesh with four fingers as the thumbs pushed the leathery exocarp forward thus splitting the peel. I would sift through the membrane like a brain surgeon and gently pluck out the seeds. After they were neatly collected on my plate I ate with my fingers enjoying the sensation of touch and taste. The work was worth it and not just because it was delicious. Pomegranates are a mighty, mighty fruit. They are packed with antioxidants which can inhibit the formation of certain toxins on a cellular level. While research is still taking place, many studies have shown that antioxidants contribute to a healthy circulatory system by removing plaque in blood vessels and may even protect against cancer. We chose what we put into our bodies. It might be easier to shovel a few peanuts in our mouth as we’re running out the door or stop and get a doughnut on the way to work but that doesn’t make it easier for the systems in our bodies. Take time out for yourself to learn more about what foods are best for you and also for the satisfaction that follows a delicious investment in the meals you’ve prepared.